Today, the 14th of May, was an extremely important day for 17th-century France. King Henri IV, previously known as the King of Navarre, was assassinated by a Catholic, on this day in 1610. In his youth, Henri was one of the most important Huguenot (French Calvinist Protestant) leaders besides figures such as Admiral Coligny. The year was 1572 and animosity, hatred, and fear divided France between Catholic and Huguenot. Violence was almost ever-present. In a scheme to unite the warring religious groups and end the Wars of Religion, the domineering Catherine de’ Medici forced her daughter, Marguerite de Valois, to marry Henri. Catherine’s son, Charles IX, was King of France at this time, but he was a weak individual, easily dominated by his mother or Admiral Coligny. The power struggles at this court were intense. Thousands of Catholics and Protestants converged in the swelteringly hot, filthy, and crowded streets of Paris in celebration of the marriage between Henri and Marguerite. Tensions were already high, but what happened next would go down in history’s most infamous passages. Le massacre de la Saint-Barthélemy par François Dubois (1529–1584). The Saint Bartholomew’s Day Massacre occurred on 24/25th August, 1572. It began when Admiral Coligny – beloved hero of the Huguenots – was set upon in a botched assassination attempt. He was stabbed, defenestrated (thrown out a window) and beheaded. Quite possibly one of the worst ways I’ve ever read of someone dying. Such brutality. He brought about the Edict of Nantes which was an amazingly modern, tolerant law that meant Huguenots could practice their religion without persecution. France finally found some internal peace. Ironically, Henri’s own grandson, the Sun King Louis XIV, would end the Edict of Nantes with his Edict of Fontainebleau (also known as the Revocation of the Edict of Nantes), which sent thousands of Huguenots fleeing from their homes in France. Henri and Margot’s unhappy marriage was eventually annulled and he re-married, this time, to Marie de’ Medici. I should probably add that Henri had a large number of mistresses – some accounts say over fifty! Marguerite, who had lovers herself (including a very ill-fated liaison with de la Mole) went on to become a very kind philanthropist for the poor, and of course, is most associated with the 19th century historical novel about her, La Reine Margot, by Alexandre Dumas, pere, and it’s screen adaptation in 1994 starring Isabelle Adjani as Marguerite and Daniel Auteuil as Henri. Henri IV, King of France, was killed on Friday, May 14th, 1610 in Paris, inside his partially open coach. The autopsy was performed the following day by Jacques Guillemeau, whose report was published in 1612. The murderer’s position was deduced from the direction of the lethal second wound. We suppose that Ravaillac used his left hand (he was an ambidexter) hitting Henri IV under the left arm; the King was bent on his right side after the first wound, a superficial one. Ravaillac jumped up on a post by his left foot, then on the nave of the left-back wheel with his right foot and turning, gripped something high on the coach and hit with his long knife the left side of the king’s chest. The direction of the wound was 40 degrees posterior and 30 degrees ascending. The pulmonary perforation involved a haemoptysis, an inability to speak and a bilateral pulmonary inundation. The left haemothorax was very probably associated to an haemopericardium and an haemomediastinum leading to a rapid collapse with a loss of consciousness which could not last than ten or fifteen minutes before death. Moving along. As a result of this tragedy, Henri’s son, Louis, was just a boy when his father was murdered, making him King Louis XIII. 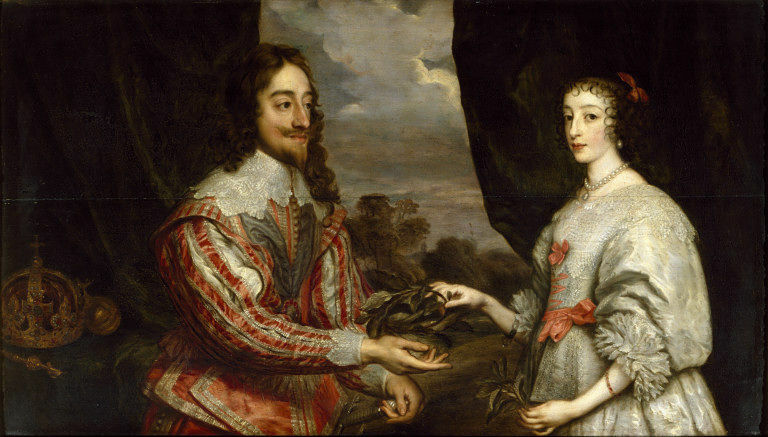 His sister, Henri’s daughter, Henrietta Maria, later became queen consort to Charles I of England, Scotland, and Ireland. The House of Bourbon was united to the House of Stuart. I mentioned earlier that the 14th was very important, and it was, not only for Henri’s assassination, his son becoming Louis XIII, but Louis himself who later married Anne of Austria, died on this same day in 1643, so it also means that his son became Louis XIV (though still a child). Fast forward into the late 18th century, when those damnable French Revolutionaries had a nasty habit of desecrating royal tombs -Henri IV’s was no exception – his head went missing. Recently, a head believed to be his was found, and happily, was confirmed to be his! You can also listen to the BBC Radio 4 programme “In Our Time with Melvin Bragg” which discusses the infamous St Bartholomew’s Day Massacre. Had a bit of a crush on Henri since reading Jean Plaidy’s “Evergreen Gallant” as a teenager so thanks for letting me know about the possibly discovery of his head….The Richard III discovery made the news here in Australia but no mention of Henri! Excerpts from John Dryden’s Poetical Works → ← “His Last Mistress” Has a Cover!